One of the more important legacies of the Civil War was the many innovations that it introduced to the United States. For instance, the Civil War was one of the first wars in world history where rifles were used extensively. The telegraph was used to relay messages between commanders and railroads were used to transport troops to and from the front. Truly, the Civil War was one of innovation, but not all innovations employed during the war were technical. The formations of regiments during the Civil War, by both the Union and Confederate armies, followed a template that was used during the Revolutionary War whereby regiments were created in each state. Soldiers from Tennessee would generally fight in a Tennessee regiment, soldiers from New York in New York regiments, etc. But the United States had already changed significantly, regarding demographics, by the time the Civil War began in 1861. A large number of European immigrants who came to the United States in the decades during the Antebellum Period made creating army regiments a bit more complicated. Instead of just organizing soldiers according to their home states, the Union army, and to a lesser extent the Confederate army, also organized their fighting men according to their ethnicities and national origin. 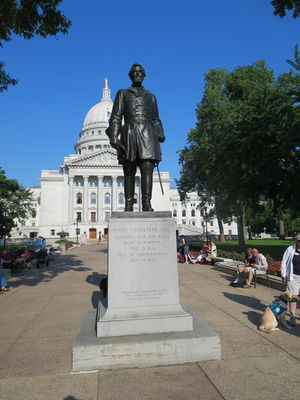 Most of the Union’s ethnic regiments were Irish and German, but Scandinavian immigrants volunteered in great enough numbers that they were able to form several companies and even one complete regiment – the 15th Wisconsin Volunteer Regiment. The reasons why Scandinavian immigrants volunteered to fight in the Union army were as diverse as the army itself, but the primary reasons were ones that can be seen in previous and later periods of American history. Scandinavians believed in the Republic, were ardent supporters of President Abraham Lincoln, and wanted to prove to their generational American neighbors that they too belonged in the United States. Along with the ideological reasons, many Scandinavians also joined for personal advancement and glory. Although there were a small number of Swedes living in America at the time of the Revolution, Scandinavian immigration to the United States did not happen in any substantial numbers until the 1830s, which was accompanied by large numbers of immigrants from the German-speaking kingdoms as well as Ireland. Historians generally see the 1825 voyage of the sloop Restauration from Stavanger, Norway to the United States as the beginning of the great wave of Scandinavian immigration, even though the ship only carried about fifty immigrants. Once the immigrants from the Restauration safely made it to the United States and wrote back home to tell their families about all the fertile farmland in America, ships began leaving the major ports of Scandinavia regularly filled with emigrants. The land was perhaps the greatest pulling factor that brought Scandinavians to the United States during the Antebellum Period. Because of the often rugged terrain and inheritance laws that prevented many young men from finding even the smallest plots from which to start a farm, the land was at a premium in Scandinavia. American railroad companies were aware of the situation in Scandinavia and saw the problem there as a potential solution to one of their problems. As the United States moved west, so too did the railroads, but the railroads wanted people to populate the areas around the land they had bought in the newly organized states and territories of Illinois, Wisconsin, Iowa, and Minnesota. They saw Scandinavians, who were known for being industrious, as a suitable population to buy their land and create towns along the railroads. The railroad companies sent representatives to Norway and Sweden with offers of cheap land to entice young men and families to immigrate to what was then known as the northwestern region of the United States. Along with the factors that pulled Scandinavians to the United States, there were several that pushed them away from Scandinavia. In the late 1840s, Norway was hit by an economic depression that left many of its people unemployed and hungry. 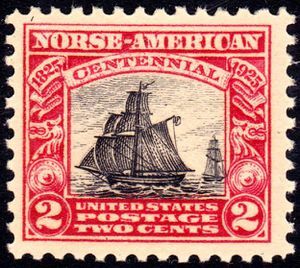 Many Norwegians saw the United States as their best chance to start over as by that time letters from the vesterheim, or “western home” as many called America, told of the nation’s abundance of land, jobs, and food. When the Civil War began, there was no shortage of volunteers in both the Union and Confederate armies. Among the many advantages that the Union army had over its counterpart was a continuous supply of potential recruits coming across the Atlantic. Irish and German immigrants comprised the highest numbers of immigrant Union soldiers, but they were underrepresented per their share of the population. As influential citizens in the newly formed Scandinavian communities of America watched Irish and German immigrants march off to war, many believed that it was their duty as new Americans to rally their communities to the Union cause. The call to arms was made throughout the country in the Norwegian and Swedish language newspapers with many young men answering. The first all-Scandinavian company in the Union army (companies were 1000 men units) was the Scandinavian Company of the First New York Volunteers regiment, which was mustered on April 25, 1861. Soon to follow was Company D of the Minnesota 3rd regiment and the Danish Guards of the Wisconsin 3rd regiment. It is difficult to put a definitive number on the number of Scandinavians who served in the Union army because ethnic identification can be fluid. Many first-generation Scandinavians no longer saw themselves as Norwegian, Swedish, and Danish and many Anglicized their more obvious sounding Scandinavian names when they came to the United States. Still, there are reasonable estimates of the numbers that have been published in academic studies. 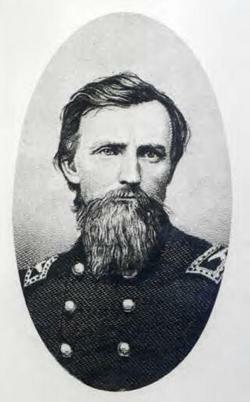 Swedish volunteers from the states of Wisconsin, Illinois, Iowa, and Minnesota numbered over 2,100  while the number of Norwegian volunteers was a bit higher with about 400 from Iowa, 800 coming from Minnesota, and over 800 entering the Union army from Wisconsin. It was a large number of Norwegian recruits from Minnesota, Iowa, and Wisconsin that led to the formation of the only all-Scandinavian regiment in the Civil War – the 15th Wisconsin Volunteers. The concept of an all-Scandinavian regiment was the idea of Norwegian immigrant and Republican Party activist, Hans Christian Heg (1829-1863). Heg drew on the enthusiasm of Scandinavians, in what is now the upper Midwest, for the Republican Party and the Union cause to create a regiment of nearly all Norwegian men. When the regiment was mustered for service on March 2, 1863, it was a bit short of true regiment strength with just 900. 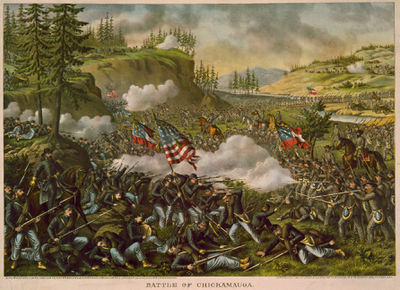 Once it went into action, the 15th Wisconsin played a key role in many later battles in the western theater of operations including Murfreesboro and Chickamauga, where Heg lost his life and more than ten percent of the regiment was either killed, wounded, or missing. There is no doubt that the men of the 15th Wisconsin were brave, but what inspired that bravery is as important as any battle they fought. Scandinavians, like most people, had many reasons to join the Union army, foremost was their support for President Abraham Lincoln and the Republican Party. When the war began, most immigrant groups in the United States supported the Democrat Party. The nascent Republican Party formed as a coalition of former Whig Party, Free Soil Party, and American Party members. The influence of the former American Party, which was an unapologetically anti-immigrant party, on the Republicans turned off many new immigrants, but not Scandinavians, who mostly lived in rural areas far from the ethnic strife in larger cities. Scandinavians supported the anti-slavery platform of the Republican Party because they saw it as a cultural and economic threat to their existence as small farmers, but also on moral grounds as evidenced by the anti-slavery resolutions that were adopted by most of the Lutheran synods of the time. Scandinavian support for Lincoln and the Republicans was visible in the 1860 and 1864 presidential elections when their votes helped Lincoln carry the upper Midwest by a large margin. The Lutheran churches played a significant role in influencing Scandinavian support for the Union, but the Scandinavian language newspapers played an even more substantial part. Similar to the young men who signed up in Scandinavia to the Union army to get passage to and citizenship in America, were the soldiers of fortune. Although long past their days as Viking warriors, Scandinavians in the nineteenth century, especially Swedes, were still known for their martial abilities. Many Swedes distinguished themselves in European wars and saw more opportunities when the Civil War started. Some of these Swedish soldiers of fortune who fought for the Union included Jakob Cederström, who first distinguished himself in the First Schleswig War in 1848-49 for Denmark before coming to the United States to fight for the Union at the Battle of Antietam. One of the most interesting and important legacies of the American Civil War was a large number of immigrants who volunteered to fight for their new country, many of whom were young men from Scandinavia. The reasons why Scandinavians joined the Union cause were many and complex. The pro-Republican influence of the Scandinavian language press and the Lutheran churches played a role along with genuine patriotic feelings that were prevalent in the Scandinavian communities. Although most Scandinavian volunteers did so out of belief in the Union cause, there were still many who joined to obtain U.S. citizenship or even to advance their military careers. Truly, in many ways, the Civil War was an opportunity for Scandinavians to prove that they belonged in the American landscape. 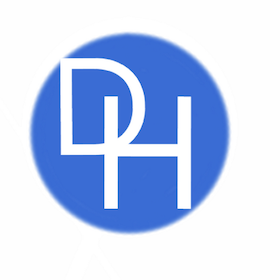 This page was last edited on 4 January 2019, at 13:06.